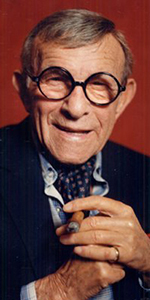 George Burns was a leading comic on the radio from the 1930s on, partnering with his wife, Gracie Allen. Known as Burns & Allen, they made movies and television shows. George outlived Gracie and became something of a showbiz legend. He was universally loved. Nathan Birnbaum was the ninth of twelve children; his Jewish parents had emmigrated from Galicia, in what is now the Ukraine. His father was a cantor, but earned his living as a laundryman. His mother died in the flu epidemic of 1903. Nattie, as he was called, helped the family by selling newspapers, shining shoes, and being a messenger boy. He got a job working making syrup in the basement of a candy store. To relieve the bordom, Nattie and the other three boys sang songs in harmony. People began to visit the syrup-makers in the basement and give them coins. Nattie was convinced: Showbiz was the way out. The group sang on street corners as the "Pee-Wee Quartette." Drafted at the beginning of World War I, Nate was disqualified due to being nearsighted. Changing his name to George Burns, he made his one and only appearance on Broadway in When Johnny Comes Marching Home for 48 perfs in May, 1917 at the New Amsterdam Theatre — it bombed. He got married to dancer Hannah Siegel because her parents wouldn't let the pair tour unless they were married. The union didn't last; they divorced in 1921. Nu — Ukrainian Jew George Burns knocked about until one day in 1923, at a vaudeville house in Union City, New Jersey, he met an Irish Catholic woman named Gracie Allen. They formed a comedy duo which clicked immediately. Allen was initially the "straight man" with Burns getting the laughs, but when he switched it — Burns the straight man with Allen doing the laugh lines — it worked even better. They kept it going for the rest of their careers. After becoming a solid on the vaudeville circuit, they fell in love and married in January, 1926. Lambchops (released in October, 1929), for Warner Bros. They made a number of shorts for the studio before starting their radio show The Adventures of Gracie on CBS in September, 1934. Their first feature film was Paramount's The Big Broadcast (released in October, 1932), with W.C. Fields. This was followed by International House (released in May, 1933), with W.C. Fields, and Rudy Vallée, and Six of a Kind (released in February, 1934), with Charlie Ruggles. The continued to appear in the revue films The Big Broadcast of 1936 (released in September, 1935), with Jack Oakie, and The Big Broadcast of 1937 (released in October, 1936), with Jack Benny. They reached their height as movie stars by getting second billing under Fred Astaire in his first musical without Ginger Rogers, A Damsel in Distress (released in November, 1937). In 1937, The Burns and Allen Show moved from CBS to NBC, where the show would run for another 12 years. In 1949, their pal Jack Benny moved his radio program from NBC to CBS, a move which influenced many stars, including Burns and Allen. The radio show was rolled into the television program The George Burns and Gracie Allen Show for 292 episodes over CBS from October, 1950 to September, 1958. Gracie, having difficulties due to heart troubles, finally was able to retire. George kept going solo with The George Burns Show for 25 episodes over NBC from October, 1958 to April, 1959, but without Gracie — it wasn't the same. Burns wrote his first autobiography, I Love Her, That's Why, published in 1955. 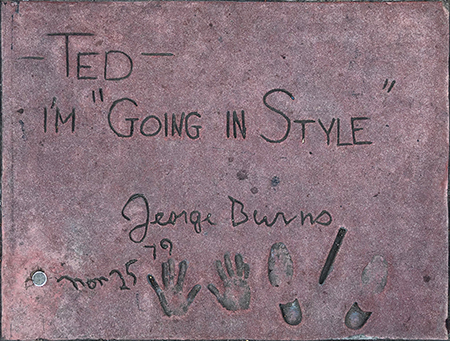 Burns did 11 turns onThe Jack Benny Program aired over CBS from March, 1952 to January, 1964, which was itself produced by Burns' production company. Gracie lost her battle with heart disease in August, 1964 at the age of 69. George found it very difficult to find his balance without her. He guested on The Lucy Show aired over CBS in September, 1966, and Here's Lucy aired over CBS in November, 1970. He even guested on The Sonny and Cher Comedy Hour aired over CBS, in March, 1972. Jack Benny had accepted the role of Al Lewis opposite Walter Matthau in The Sunshine Boys (released in November, 1975), but his health wouldn't allow it. Burns stepped into the role and won a Best Supporting Actor Oscar for it. Burn's second autobiography, Living It Up: Or, They Still Love Me in Altoona, was published in 1976. After The Sunshine Boys, Burn became something of a fixture in comedy films. He played God in Carl Reiner's hit Oh, God! (released in October, 1977), with John Denver, and the caper comedy Going in Style (released in December, 1979), with Art Carney and Lee Strasberg. His next memior was The Third Time Around, published in 1980. Oh, Good! Book II (released in October, 1980), with Suzanne Pleshette, got along enough to warrant another installment, Oh, God! You Devil (which played the Chinese in November, 1984), with Ted Wass. 18 Again (released in April, 1988), with Charlie Schlatter, was an idea that cashed in with Big just a couple moths later. Burns trades places with an 18 year-old. Burns injured his head after slipping in his bathtub in July, 1994, and was operated on. Burn's final film was a cameo in the comedy Radioland Murders (released in October, 1994). Frank Sinatra threw Burns a birthday party in December, 1995, where it is believed he caught the flu, wosening his condition. He died at home in March, 1996, just after turning 100. His headstone reads "Gracie Allen & George Burns — Together Again. Mann's Chinese Theatre, Hollywood, California. 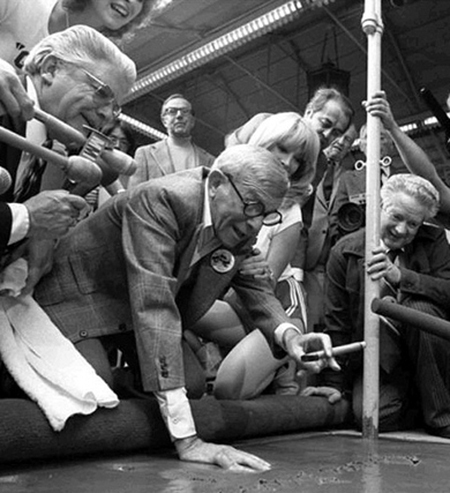 George Burns Forecourt ceremony, Thursday, January 25, 1979. Mr. Burns, with ever-present cigar, places his hand into the cement.